Huskies are dog variants added by the Dawnguard add-on. They can be found accompanying members of the Dawnguard in battle, or also with members of the Vigil of Stendarr. They drop dog meat, and also have a 10% chance of dropping minor loot, including leveled rings, gems, and gold. 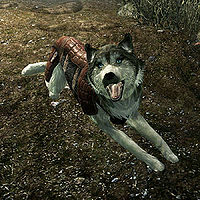 Two Huskies, Bran and Sceolang, can be used as followers if you side with the Dawnguard in Dawnguard's main questline. Huskies may not appear at Fort Dawnguard or in the game at all and may require a mod or console command to access them. Esta página foi modificada pela última vez à(s) 04h13min de 7 de maio de 2015.